This page notes details of Fire King Avatar Kirin (FIRE/Beast/Effect Monster) : decks, tips, effect and rulings. Learn and enjoy playing Yu-Gi-Oh! Duel Links! 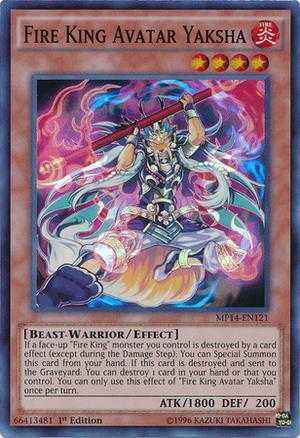 If a face-up "Fire King" monster you control is destroyed by a card effect (except during the Damage Step): You can Special Summon this card from your hand. 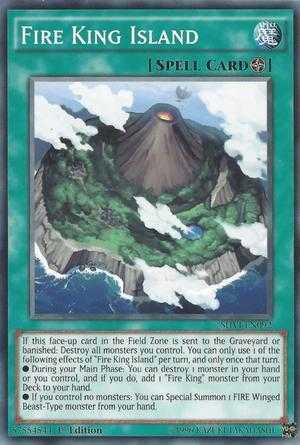 If this card is destroyed and sent to the Graveyard: You can send 1 FIRE monster from your Deck to the Graveyard. This card can be Special Summoned from your hand. Stats are low which makes it unreliable in battle and susceptible to attacks. It could work with Volcanic Archetype and Manticore of Darkness. Surprisingly, it doesn't contribute that much to his own Archetype though. whatr is the sense behind put a fire monster from the deck to the graveyard, it doesn't work to summon nephthys?? The Fire/Winged Beast ninja does have synergy with this effect and also the fire island field spell.